There is a great deal more to a child’s first communion than a pretty white dress and a family party. While it is a cause for celebration, that’s not what the occasion is about. 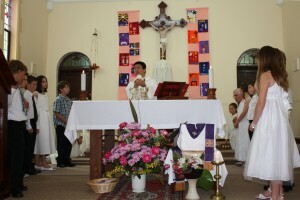 The event means that the children have learned and understood, the mystery of transubstantiation, the changing of the substance of ordinary bread and wine into the substance of Christ’s body and blood. Within both our school and after school programs we seek to impart the understanding of this mystery, such that the children will appreciate for their lifetime the incredible gift which Christ himself offers us at every Eucharistic celebration.